Ken Lum » Eternal Glory to the People’s Heroes! Eternal Glory to the People’s Heroes! Next year, 2019, will mark an ignominious anniversary in China. Thirty years will have passed since the violent crackdown of student protesters on Tiananmen Square in Beijing. The events of 1989 continue to reverberate both in terms of China’s domestic politics and its relationship to the world. It is important to note that internal protests against the prevailing government has recurred numerous times throughout China’s history, going back to at least Emperor Qin Shi Huang two hundred years BCE. The 1989 protests represent the latest mass challenge by Chinese citizens towards their own government. It was Chairman Mao Zedong himself who promoted the idea and necessity of a permanent cultural revolution to safeguard the purity of the Communist leadership as China’s sole legitimate rulers. His “Let a hundred flowers bloom”and “Smash the four olds,”exhorted in 1958 and 1966 respectively, encouraged Chinese people to protest against authority and to even denounce official government policy with the aim of purging all counter-revolutionary or capitalistic tendencies as well as tradition-bound thinking that might weaken Communist fervor. It was in this spirit of ensuring the futurity of China by demanding political reform, not necessarily the overthrow of the government, was the basis for student protests in 1989. From the perspective of the West, the aspirations of the students were seen as embodied aesthetically by the Goddess of Democracy, an almost ten-meter tall foam and papier-mâché sculpture created by students of the prestigious Central Academy of Fine Art in Beijing. Hurriedly produced to bolster the flagging morale of students who had been encamped for several weeks on the square, the statue was seen as inflammatory by some members of the Chinese politburo because of its resemblance to the Statue of Liberty in the United States. The Goddess of Democracy stood all of five days before troops of the People’s Liberation Army entered Tiananmen Square in tanks and armored personnel carriers in an act of bloody suppression. The Goddess of Democracy has since accrued the status of a global icon symbolizing far more than its original affiliation with the student protest movement in Tiananmen Square. Today, it embodies Western-defined democracy and freedom with the widest brush. Replicas of the original statue have been installed in a number of cities around the world, including San Francisco, Vancouver, and Toronto. In Washington, D.C., a replica of the Goddess of Democracy is dedicated to the Victims of Communism worldwide. But the most important aesthetic edifice relating to the events of Tiananmen Square is not the Goddess of Democracy, but another sculptural work designed not by the students of the Central China Academy of Art, but by its professors. The Monument to the People’s Heroes is often overlooked by non-Chinese eyes despite its centrality to 1989. It was in front of this particular monument that protesting students and workers first congregated. In fact, it had been a gathering point for protest since its erection in 1958, the same year as the launch of the Great Leap Forward, an economic and social campaign launched by Mao to collectivize all agricultural production and to purge from China all trace of private ownership. The conception for a monument to Chinese resistance and martyrdom preceded the formal declaration of the People’s Republic of China in 1949 after Communist victory was assured in its civil war with Chiang Kai Shek’s Nationalist forces. There were many different conceptual iterations for a monument and the team tasked with its design pondered many questions, including the problem of how to negotiate Mao’s presence within a form memorializing the dead. The Goddess of Democracy and the Monument to the People’s Heroes operate as a dialectic to one another. Temporally, one is improvised, non-official, and short-lived, while the other overly deliberated upon, official, and intended for posterity. The Monument to the People’s Heroes takes the form of a traditional obelisk and was conceived as a point of dialogue to the Tiananmen Gate upon which Mao Zedong’s outsized portrait is installed. 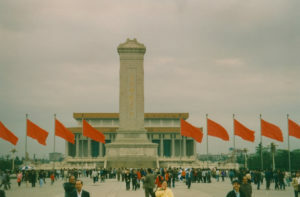 As the only vertical monument on Tiananmen Square, it was located within the square along the old north-south imperial axis that dates back to the Yuan Dynasty of Emperor Kublai Khan of the thirteenth-century. Its location in the square did not reassert the imperial axis so much as break it with its language of sculptural autonomy and presence, forcing viewers to gaze up rather than at the integrated alignment northward towards the former court and residence of the Emperor. The highly visible isolation of the monument, standing as it does amidst a vast and flat concrete surrounding, operates in contradistinction to the hidden isolation of China’s Communist rulers who were now ensconced behind the impenetrable walls of the former imperial palace complex known as the Forbidden City. Eternal glory to the heroes of the people who laid down their lives in the people’s war of liberation and the people’s revolution in the past three years! Eternal glory to the heroes of the people who laid down their lives in the people’s war of liberation and the people’s revolution in the past thirty years! Eternal glory to the heroes of the people who from 1840 laid down their lives in the many struggles against domestic and foreign enemies and for national independence and the freedom and well-being of the people! The key here is the extolling of brave Chinese to defend their country in the name of liberation and revolution. Those enemies need not be foreign, but domestic, including the government. The year 1840 refers to the start of the Opium War against foreign powers as well as the resistance to the Chinese government of the day who prioritized self-preservation over the needs and demands of the Chinese people. 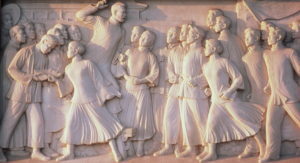 The iconography of the Monument to the People’s Heroes grants permission from the state for the people of China to protest against its own government. It is no surprise then that the Monument to the People’s Heroes was the site of massive gathering in 1976 upon the death of beloved first premier Zhou Enlai, who was perceived as a reformer and engaged in a longstanding power struggle against more conservative senior members of the Politburo of the Chinese Communist Party. The gathering of mourners at the base of the monument quickly grew into what became known as the Tiananmen Square Protests of 1976. In 1989, the death of the liberal reformist senior leader, Hu Yaobang, prompted protests among students who wanted Hu’s reform agenda to be reinstated. Hu had been purged from his high level position as General Secretary of the Communist Party of China in 1987. The students again amassed at the base of the Monument to the People’s Heroes, discursively protected by the ambiguous status of the monument as a symbol of the right of the Chinese people to protest. The protests quickly transmogrified into a global story that would end in government brutality. During the so-called Umbrella Protests of 2014 in Hong Kong, students initiated a protest of proposed Beijing-led electoral reforms. The protest was against political encroachment from the Mainland, which threatened Hong Kong’s democratic rights and its Western-hybridized identity. A model of the Goddess of Democracy could be seen amidst the huge crowd of protesters and international media obligingly covered her presence. Significantly, a replica of the Monument to the People’s Heroes could also be seen, installed at the very center of the protest area of the Admiralty district. The irony of reproducing a monument that Mao himself ordered built, but used as a centerpiece for the Hong Kong protests was not lost on Chinese eyes.